To see if Arta M. Monjazeb is accepting new patients, or for assistance finding a UC Davis doctor, please call 800-2-UCDAVIS (800-282-3284). Cancer is not a disease that occurs in a vacuum and thus I focus not only on treating the cancer but also on assisting patients with the nutritional, social, emotional, and spiritual issues which are often ignored in modern medicine. I believe strongly in a multidisciplinary team approach to cancer including open lines of communication with both my patients and fellow physicians. Although I employ aggressive cutting edge anti-cancer treatments I am also respectful of and willing to incorporate holistic and alternative medicines into patient care. Ultimately I strive to treat each patient with the same respect and diligence I would an ailing member of my own family. Dr. Monjazeb is a clinician scientist and he is involved with cutting edge clinical and basic science research projects. He is a nationally recognized expert in cancer immunotherapy. His research is focused on understanding how the immune system can be harnessed to fight cancer and how radiotherapy can be used to promote anti-tumor immune responses. Dr. Monjazeb has a clinical focus on the treatment of gastrointestinal malignancies (including esophageal cancer), sarcoma, melanoma and breast cancers. He specializes in various radiotherapy techniques including intensity modulated radiation therapy (IMRT), image guided radiation therapy (IGRT), stereotactic body radiotherapy (SAR / SBRT) and high dose rate brachytherapy. 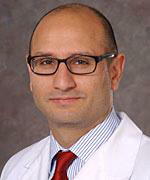 Dr. Monjazeb is a principal investigator on a number of clinical trials testing novel cancer immunotherapy approaches and sees patients with Stage IV cancer for consideration of these trials. Sckisel GD, Mirsoian A, Minnar CM, Crittenden M, Curti B, Chen JQ, Blazar BR, Borowsky AD, Monjazeb AM, Murphy WJ. Differential phenotypes of memory CD4 and CD8 T cells in the spleen and peripheral tissues following immunostimulatory therapy. J Immunother Cancer. 2017 Apr 18;5:33. Silvestrini MT, Ingham ES, Mahakian LM, Kheirolomoom A, Liu Y, Fite BZ, Tam SM, Tucci ST, Watson KD, Wong AW, Monjazeb AM, Hubbard NE, Murphy WJ, Borowsky AD, Ferrara KW. Priming is key to effective incorporation of image-guided thermal ablation into immunotherapy protocols. JCI Insight. 2017 Mar 23;2(6):e90521. Park JS, Withers SS, Modiano JF, Kent MS, Chen M, Luna JI, Culp WT, Sparger EE, Rebhun RB, Monjazeb AM, Murphy WJ, Canter RJ. Canine cancer immunotherapy studies: linking mouse and human. J Immunother Cancer. 2016 Dec 20;4:97. Park JS, Nakache YP, Katz J, Boutin RD, Steffner RJ, Monjazeb AM, Canter RJ. Conservative management of desmoid tumors is safe and effective. J Surg Res. 2016 Sep;205(1):115-20. Miyamoto J, Michaud AL, Harandi NK, Kim EJ, Semrad T, Khatri V, Mayadev J, Perks J, Monjazeb AM. The Role of Image-guided Radiotherapy in the Treatment of Anorectal Cancer Using Prone Belly-board Positioning. Anticancer Res. 2016 Jun;36(6):3013-7. Yuen NK, Li CS, Monjazeb AM, Borys D, Bold RJ, Canter RJ. Older Age Modifies Oncologic Outcome Following Radiotherapy in Soft-tissue Sarcoma: A Subtype-specific SEER Analysis. Anticancer Res. 2016 Apr;36(4):1745-50. Monjazeb AM, Kent MS, Grossenbacher SK, Mall C, Zamora AE, Mirsoian A, Chen M, Kol A, Shia SL, Reddy A, Perks RJ, Culp W, Sparger EE, Canter R, Sckisel G, Murphy WJ. Blocking Indolamine-2,3-Dioxygenase Rebound Immune Suppression Boosts Anti-tumor Effects of Radio-Immunotherapy in Murine Models and Spontaneous Canine Malignancies. Clin Cancer Res. 2016 Sep 1;22(17):4328-40. Monjazeb AM, Schoenfeld JD. Radiation dose and checkpoint blockade immunotherapy: unanswered questions. Lancet Oncol. 2016 Jan;17(1):e3-4. Dyer BA, Kahn LA, Matin M, Bold RJ, Tanaka MI, Monjazeb AM. Long-Term Progression-Free Survival in a Patient with Locally Advanced, Unresectable Pancreatic Adenocarcinoma. Cureus. 2015 Dec 15;7(12):e406. Daly ME, Monjazeb AM, Kelly K. Clinical Trials Integrating Immunotherapy and Radiation for Non-Small-Cell Lung Cancer. J Thorac Oncol. 2015 Dec;10(12):1685-93.